Monkey Baa is proud to present the world premiere of Josephine Wants to Dance, a new Australian play based on the celebrated picture book by Jackie French and Bruce Whatley which will be on at Monkey Baa Theatre from Monday 16th to Tuesday 24th of April 2018. We can't wait to see this show! The stage adaption will bring life to the iconic children’s book, set in Shaggy Gully, with stunning costume and set design, a hilarious original musical score and talented local cast. 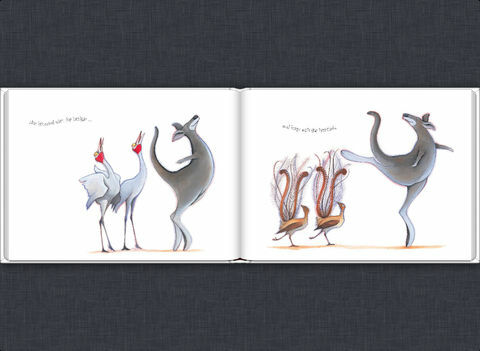 Kids aged four and over will meet Josephine, a kangaroo who loves to dance. Even though her little brother, Joey, tells her that kangaroos don’t dance, they hop, Josephine continues to point her toes and leap through the air. When a ballet troupe comes to their sleepy town of Shaggy Gully Josephine learns that there is another way to dance – ballet. She watches the dancers for hours and hours, and practices their moves at night, all alone. When the ballet troupe gets into trouble on opening night they need an understudy to replace their Prima Ballerina, but who could dance the lead role? Who else could leap that high? Josephine’s talents are called upon to help save the day. Can she do it, and more importantly, does it matter that she’s a kangaroo? The show stars Rebecca Hertherington (Heathers, Blue Heelers), Chloe Dallimore (The Producers, The Addams Family), Amanda Laing (Mr Stink, The Merchant of Venice) and Hayden Rogers (The Secret Garden, Rent). Following its world premiere at Sydney’s Lendlease Darling Quarter Theatre in April, Josephine Wants to Dance will tour 47 venues across Australia until October. Josephine Wants to Dance will be showing at Monkey Baa Theatre at Lendlease Darling Quarter Theatre from Monday 16th to Tuesday 24th of April. Tickets are $29pp, $104 Family of 4, $125 Family of 5, $25pp Groups of 10+ (no booking fees apply). For more info and bookings, head to the Monkey Baa Theatre website.